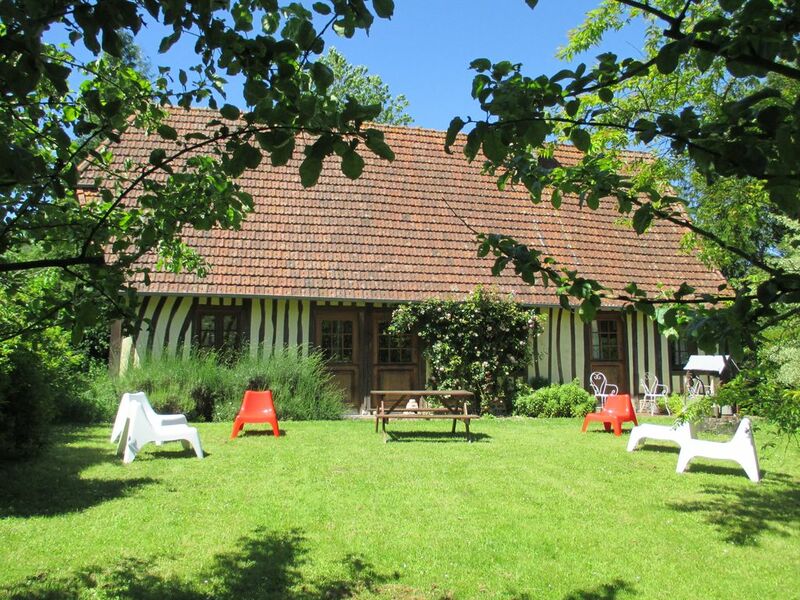 Ideal cottage for a holiday or a weekend in Normandy. Located in the heart of a property of 10 hectares, crossed by the river La Scie, this authentic Norman house facing south, overlooking an orchard, pasture and woodland. A contemporary touch is given by the gable windows and cathedral living. Near Dieppe, its thalassotherapy, its golf and not far from the gardens of Varengeville sur Mer. super quiet lovely house, you could have everything what you need, helpful owner, and you feel you are living out of this world, no stress, no problem, only injoy, what wonderful.I come back for sure. Our long weekend in the heart of the countryside was just what we needed. The beautiful, authentic house with enormous windows looking out onto the cows in the pasture, had everything we could have wanted (warm comfortable beds, coffee machine, dishwasher, etc.). Mme Marchand knows the area better than any tourist office, and guided us to flawless and enjoyable visit. She helped us to get the most out of the region and all it has to offer. I look forward to another stay in such a beautiful part of France, and in a house so comfortable and nicely decorated. Vacances idéales et reposantes à la campagne ! Super accueil de Mme Marchand qui donne de très bons conseils sur la région. Une maison de caractère, très bien équipée, la literie est confortable et surtout le cadre est magnifique, en pleine campagne, près d'un fleuve, la Scie. On recommande vivement cette location dans une région magnifique ! Zeer vriendelijk ontvangst. Mooie authentieke woning in rustige omgeving. Waren erg blij met de houtkachel. Die zorgde voor warmte en een gezellige sfeer. in deze woning. De woning is ruim alleen is 1 wc (geplaatst op badkamer) weinig. maison de charme, authentique et chaleureuse à l'image de sa propriétaire. maison très agréable, nous avons passé un super week-end (malgré le temps déplorable) dans un cadre typiquement normand. Merci à notre hôtesse pour sa gentillesse, son enthousiasme et sa générosité. Nous gardons précieusement ses coordonnées car nous n'hésiterons pas à renouveler l'expérience. Das Haus, die Umgebung und die Vermieter waren einfach großartig. Wir haben uns sehr wohlgefühlt. Der Garten, die liebevolle Einrichtung und sogar gutes WLAN. Die Umgebung ist Ideal für zahlreiche Ausflüge in die Umgebung. Ich kann dieses Haus nur jedem weiterempfehlen!